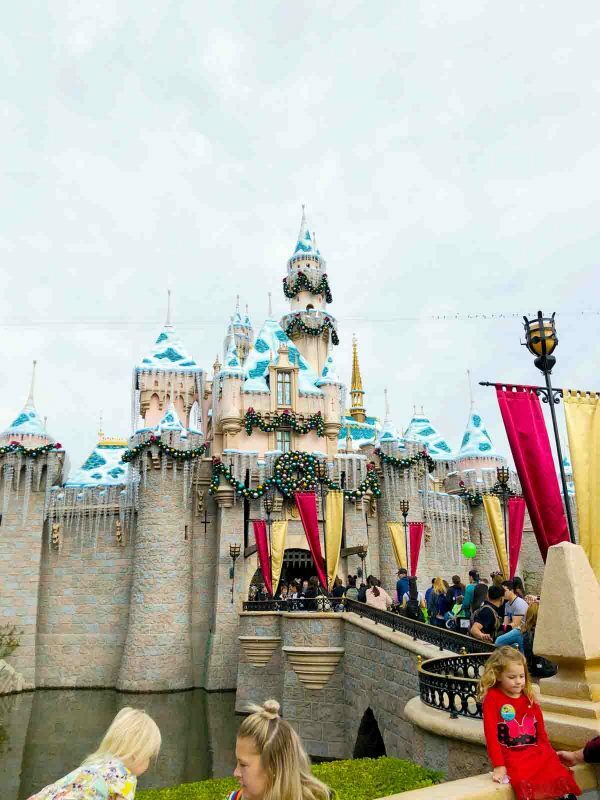 Eating our way through Disneyland, Disney California Adventure, and the Festival of Holidays 2018!! 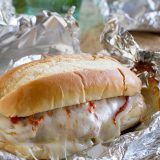 Check out the details on everything we ate and what we can’t wait to go back to eat again. 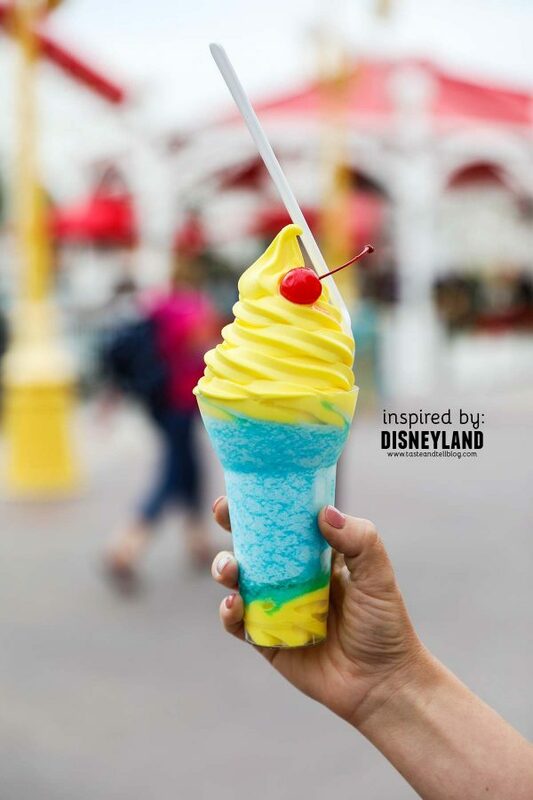 I am no stranger to Disneyland food – if you want to read all the guides, you can see part 1 here, part 2 here, and part 3 here! 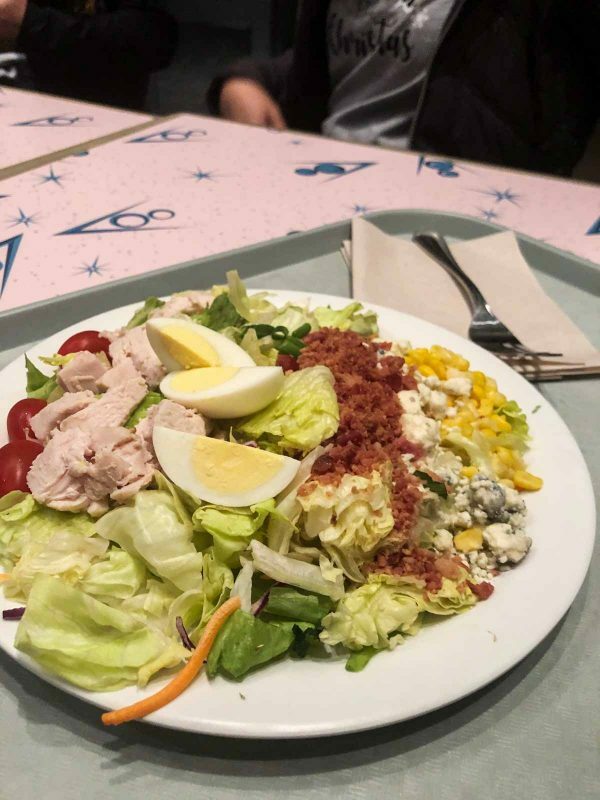 How much food can 5 adults eat at Disneyland in 2 days? If you’ve read any of my previous guides, you know that I love Disney food almost as much as I love Disneyland. One of the highlights for me is going and trying all of the new food and all of our old favorites. 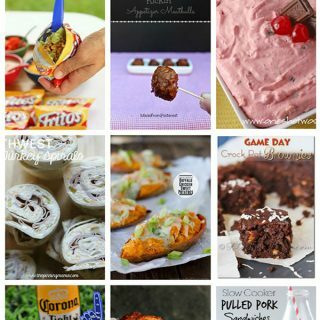 Well, we’re back again with a fun guide to everything we ate. And bonus this time – you get a video! I had so much fun filming and putting together this video showing you all of the food (and the parks!) in action. One little disclaimer before we get into all of the details – this trip actually happened last December. And yes – a lot of this is from the Festival of Holidays, which is long gone now. 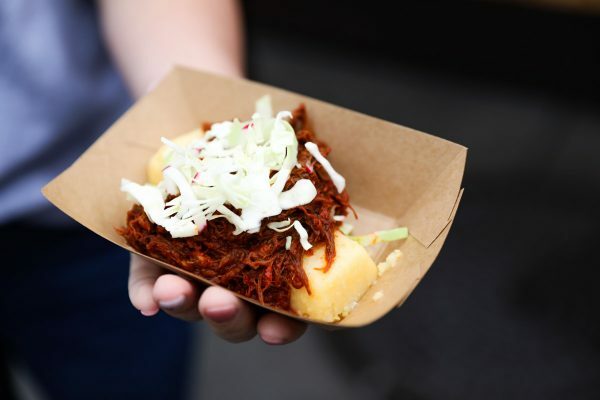 But I still wanted to share, and cross my fingers all year that some of these dishes return to the festival next year. This video is also the first part in the new Inspired By series that I have started here on Taste and Tell. Part 1 takes you through the parks with me, my mom and my sisters, and shows you everything we ate (plus some other fun tidbits along the way!) Stay tuned for part 2, where I make something that is inspired by one of the dishes that we had at Disneyland. It’s a good one! Now let’s get started with the details for all of the food we ate! 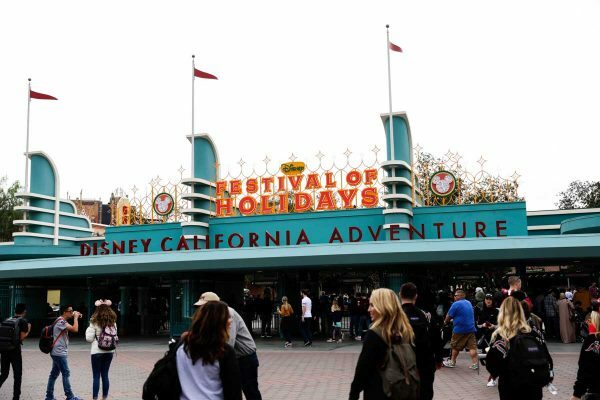 I was actually surprised to see (as I was putting this post together) that we mostly ate at Disney California Adventure this trip. (We go back and forth between the parks all day!) But I have still separated them into each park here, and will try to indicate where you can get these (or where we got the seasonal items). So this was actually my first time ever eating at Red Rose Tavern. But believe me – it will NOT be the last! We had breakfast, and really did enjoy everything we tried. We had the breakfast sandwich that comes with yummy potatoes, the Garden Vegetable Hash, which was probably my favorite, and a seasonal Holiday Pastry Wreath that had this raspberry cranberry compote in the middle that was insanely good. I really hope to get to try that one again one day. 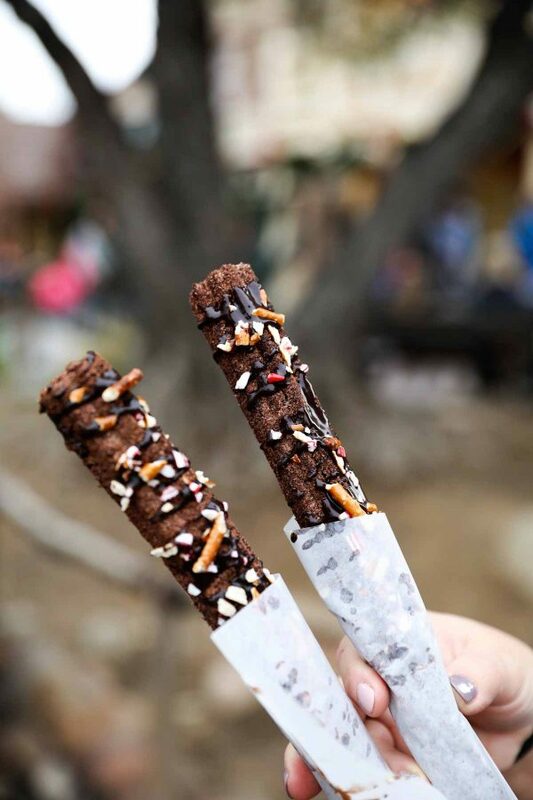 So we planned on trying all of the holiday churros, but only ended up with this Chocolate Churro with Pretzels and Peppermint. And sadly, we were a bit underwhelmed by this one. I probably liked it the most out of our group, but wouldn’t get it again. I think my biggest issue with it is that the peppermint and the pretzels are only on the top half. I wish the actual churro had some peppermint flavor to it. 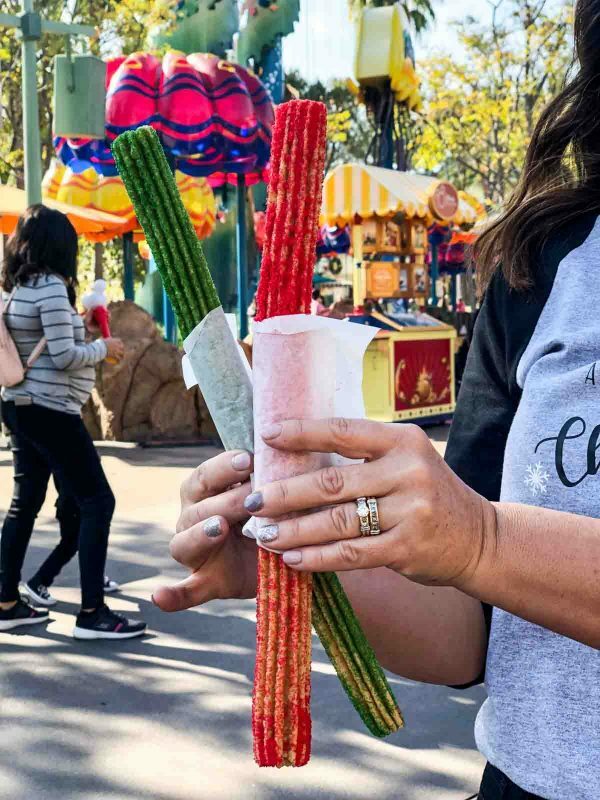 It wasn’t horrible, but not my favorite seasonal churro. 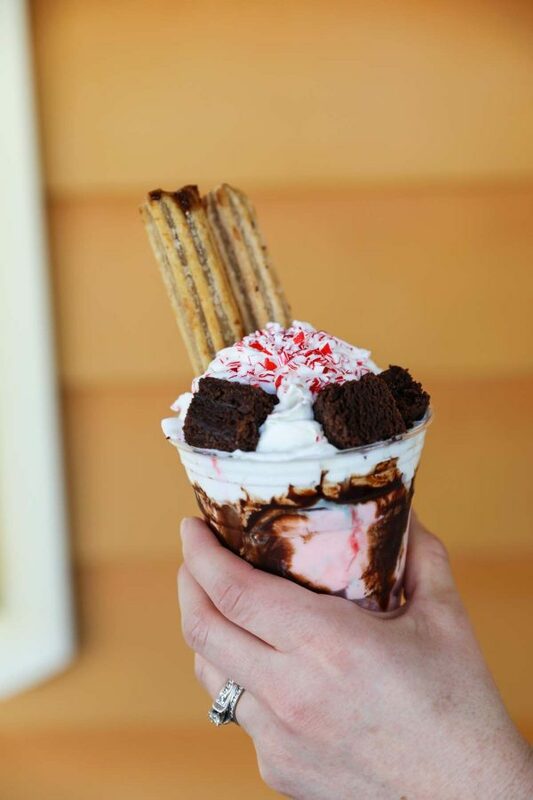 This Churro Sundae ended up being one of the all-around favorites for everyone. The churros were filled with dulce de leche, and the sundae had peppermint ice cream, fudge, whipped cream and brownie chunks. We have talked about this one multiple times since our trip! Aaannnnddd, that’s it for Disneyland! 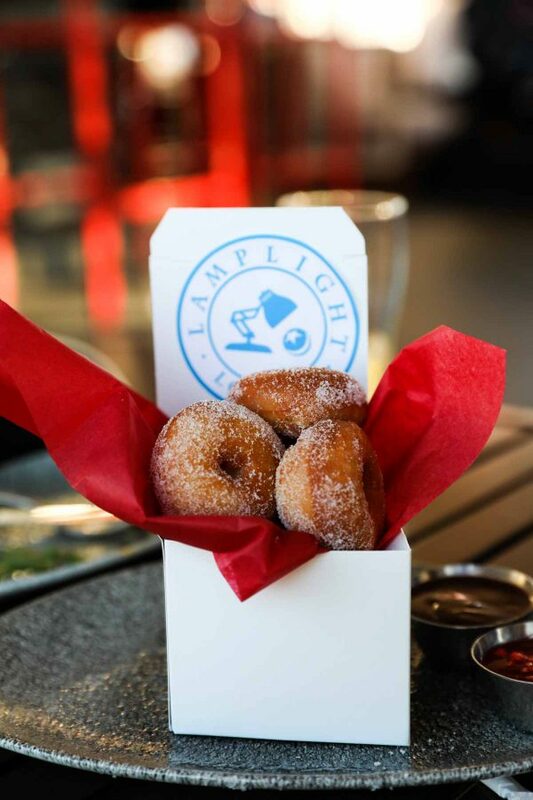 We did have some of our favorites that we have all the time that I’ve already talked about – like the Raspberry Rose Macaron, Galley Lobster Chips and Chimichangas. But there was so much more food, over at California Adventure! 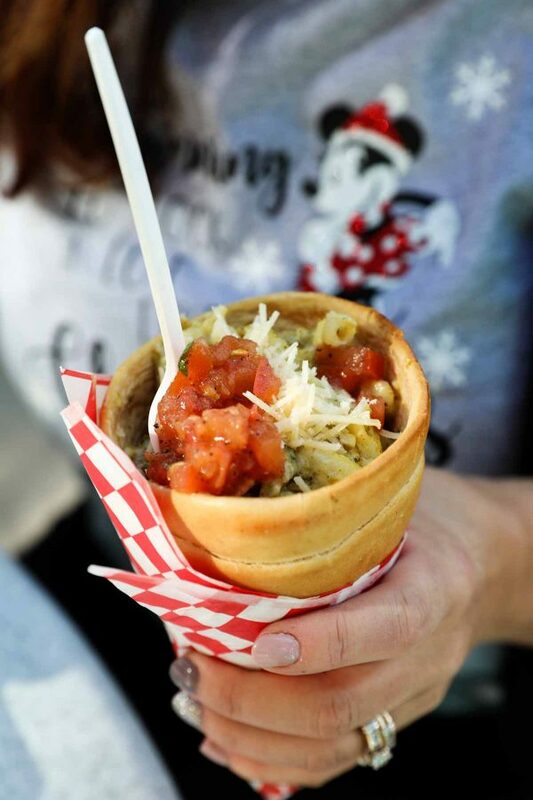 This Chicken Pesto Cone was probably one of my favorite cones that I’ve tried from the Cozy Cone Motel. 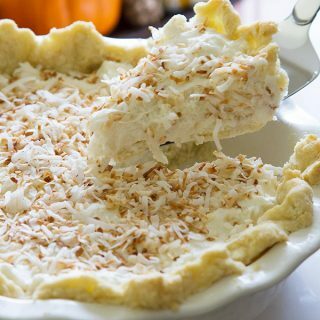 It was creamy, it was flavorful, and we ate every last bite of this. 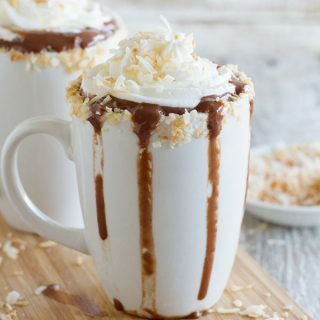 You guys – Schmoozies has really been hitting it out of the park with their seasonal desserts. 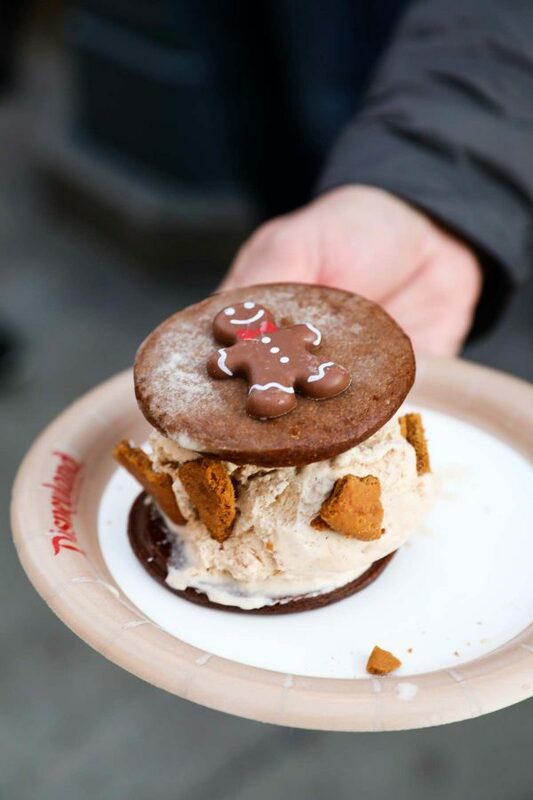 And this Gingerbread Ice Cream Sandwich was another favorite from the trip. 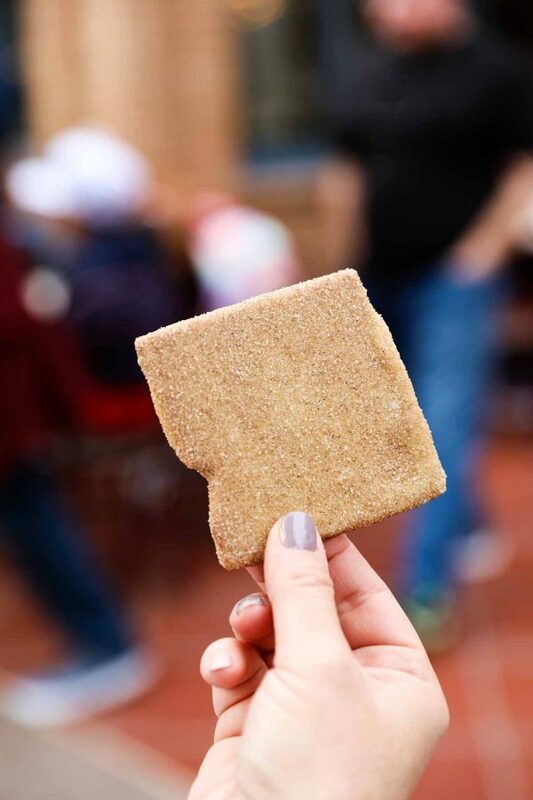 Even a few people who said they aren’t big gingerbread fans loved this one. And that brown sugar ice cream was dreamy! 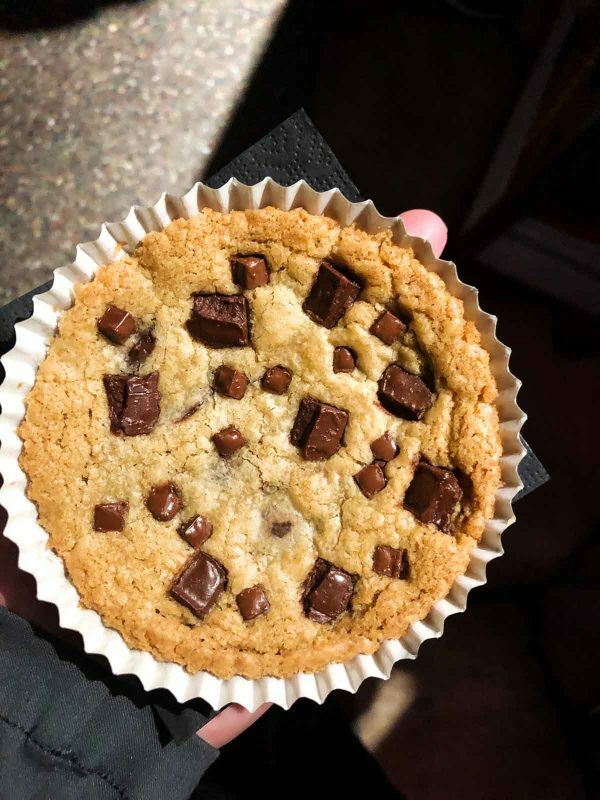 This Jack Jack Cookie Num Nums is not a seasonal item, and can be found just outside the Incredicoaster. If you love warm chocolate chip cookies, this one is for you! 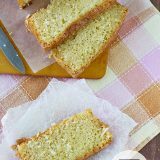 I thought it was great – it was gooey and melty (just how I like them!) but I don’t know if it’s something I’d get every time I go to Disneyland. 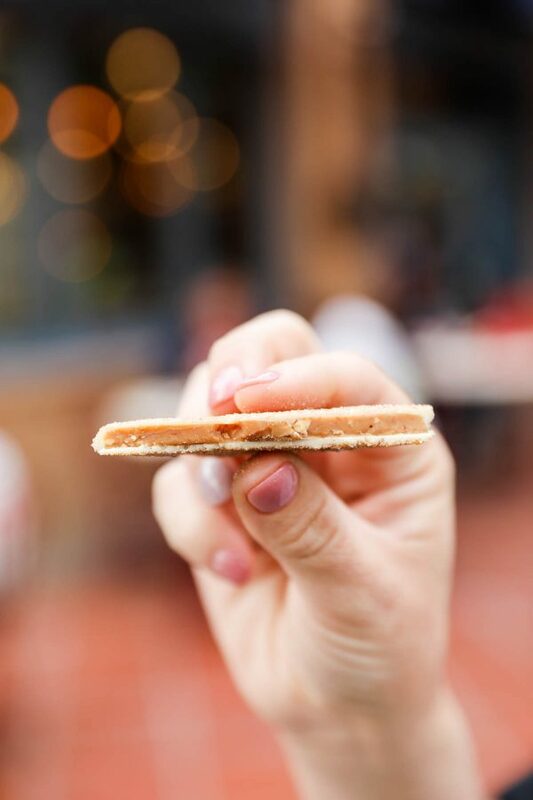 It is quite large, so be prepared to share. All 5 of us shared one, and had plenty. If there was one major surprise from this trip, it was this Pixar Pier Frosty Parfait. We almost didn’t stop. And then we almost just got the lemon soft serve. But the combination of the creamy lemon soft serve with the blue raspberry slush was pure perfection. I think we were all taken by surprise that we all loved it. I would have thought that it would have just been a novelty, but it is truly delicious. And I’m pretty sure it will be one that I have to get every trip to Disney. I had heard a lot of hype about this Churro Toffee, so it was on the top of my list of things to try. We actually had some mixed reviews on this, though. I absolutely loved it. And would totally buy it again. But I had a sister that was just eh about it. She said she preferred the regular toffee over this churro toffee. But for me, it was a winner. 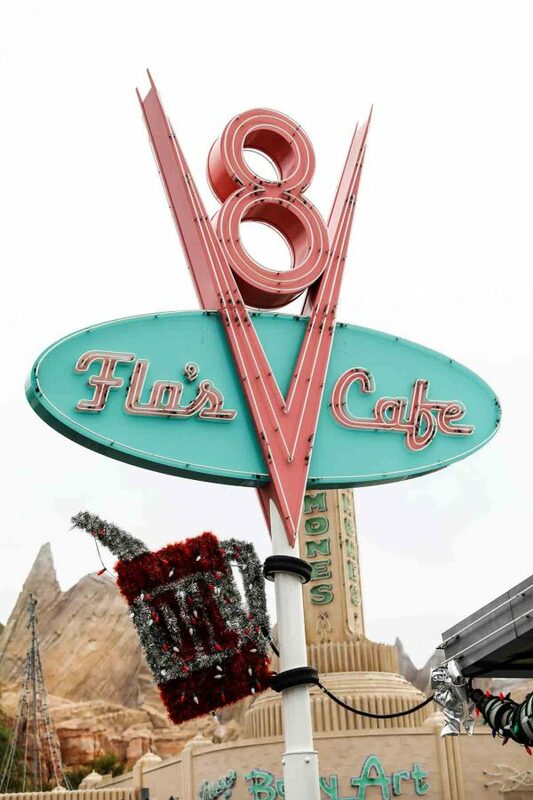 Flo’s V8 Cafe is quickly becoming one of my favorite places to eat. We ended up eating 2 meals there – once for breakfast and once for dinner. One of our must get meals every trip now is breakfast at Flo’s. 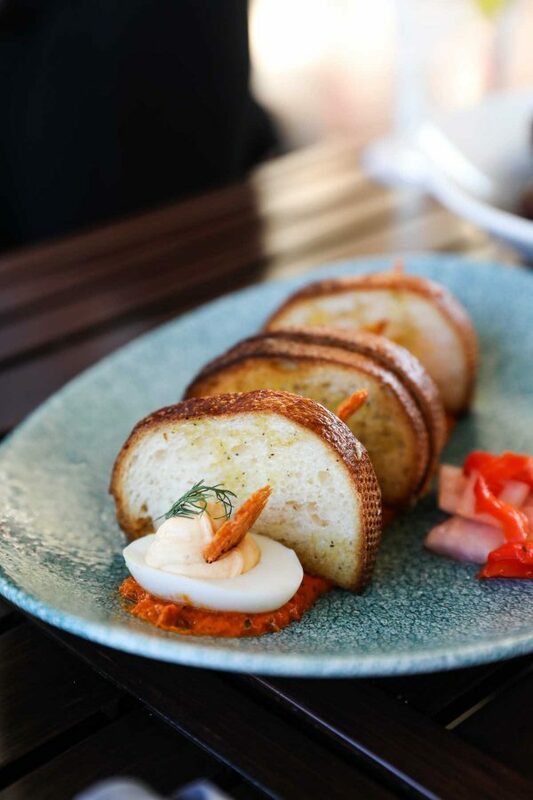 We get this Brioche French Toast and the Chicken Breakfast Tamale (below). The brioche french toast is SO good. 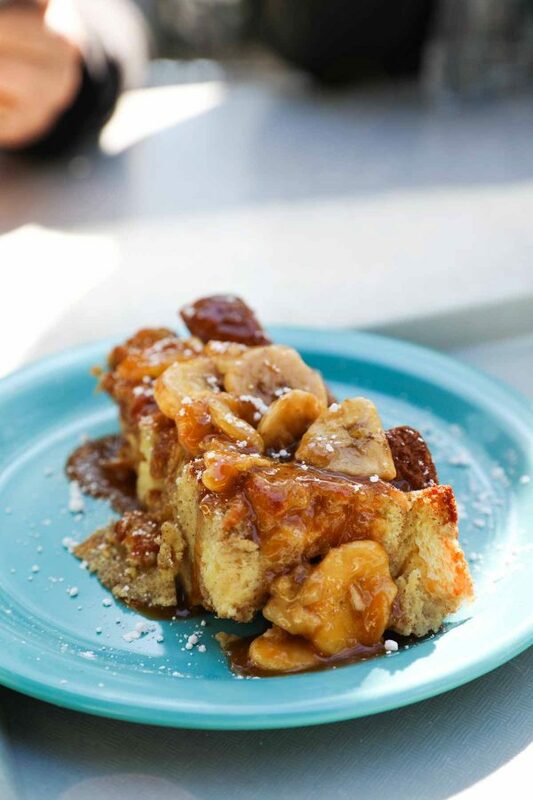 It has a baked French toast with a salted caramel sauce and bananas on top. It’s seriously lick the plate clean good. 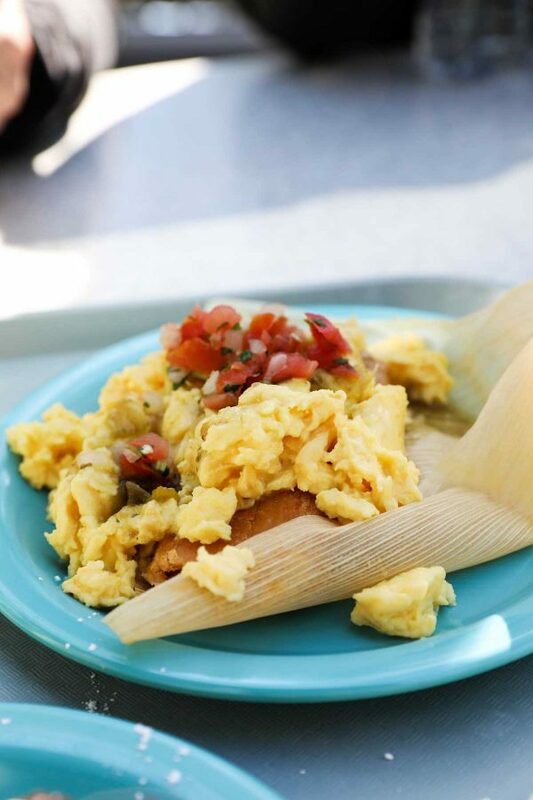 And I seriously crave this Chicken Breakfast Tamale *all* the time. It is a chicken tamale that is served with scrambled eggs over the top, as well as salsa verde and pico de gallo. 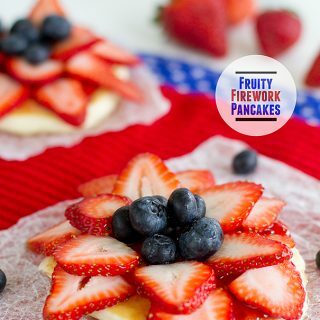 It is the perfect savory breakfast choice! This was my first time having dinner at Flo’s. We got this Cobb de Ville Salad, because we all end up craving vegetables after days of indulging! This was a great salad. No complaints at all. 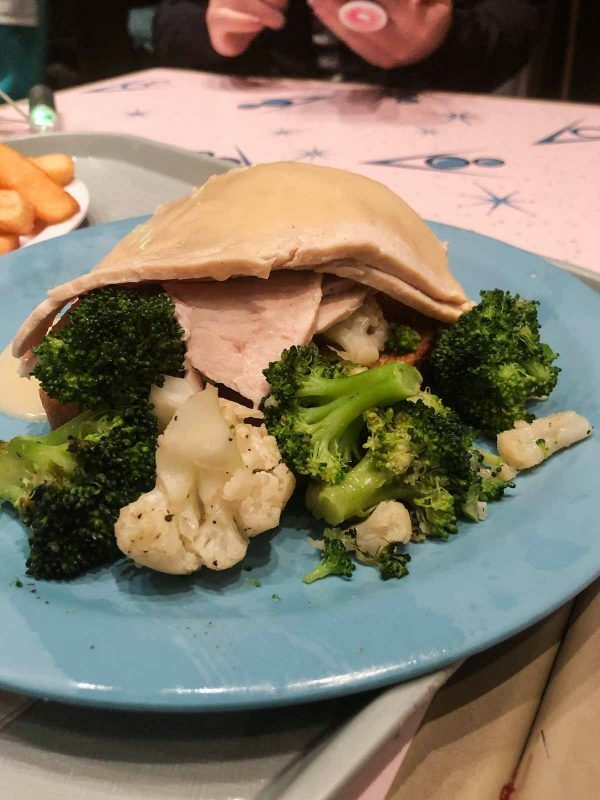 We also had this Open Faced Turkey Sandwich. I know it doesn’t look like much here. But there is a big scoop of mashed potatoes under that turkey, as well as a slice of toast. I honestly don’t remember my initial thoughts on this, but my sister commented about how she really liked it. I feel like I need to preface this. 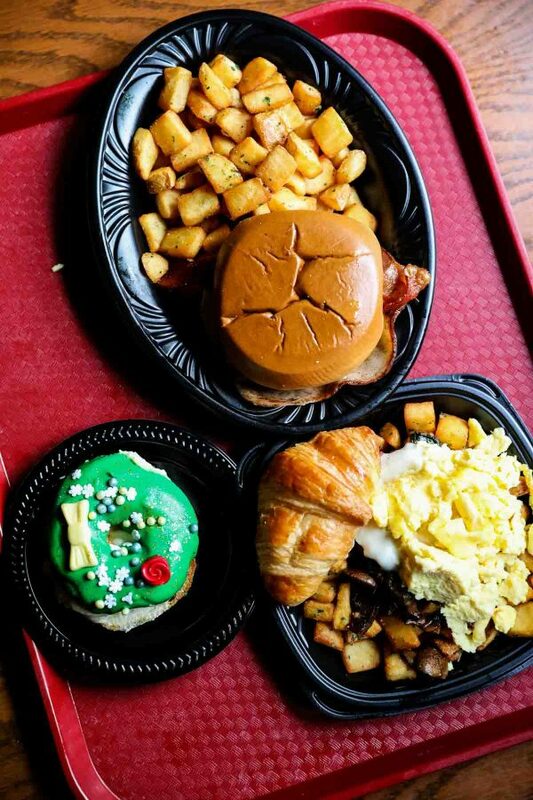 My one big want was to go to Lamplight Lounge. I had never had the famous lobster nachos from when it was Cove Bar, and this was my first trip back to Disneyland since it re-opened as Lamplight Lounge. There were no reservations available when we first planned our trip, but we didn’t give up and ended up getting reservations just a couple days before we left for our trip. I was so excited. We showed up for our reservation, and they told us it should be less than 5 minutes before they paged us to go downstairs. We waited. And waited. And waited. 15 minutes- I go and check and they said we were still on the list and that it should be soon. We waited and waited some more. At this point, I was so frustrated from having to wait so long (we ended up waiting over 45 minutes from our reservation time), that I didn’t even want to eat there anymore. I just kept thinking about the rides we could have ridden in that 45 minutes! They finally called us down, and I was expecting it to be packed, which it was not. In fact, at least half of the tables were completely empty. They sat us outside, and I was less than thrilled to see we didn’t even have a table, but what I would describe as patio furniture and a coffee table in the middle of us. It was not a relaxing meal because you had to sit on the edge of the seat, and then hold your food in your lap to eat. I only mention all of this because my reviews of Lamplight Lounge are lackluster. But in hindsight, I really think that I was thrown off by having to wait so long, and then not even getting to eat at a table. When we left, I said I’d never eat there again, but now I do think I’d like to go back to see if my opinion changed with a more positive experience. 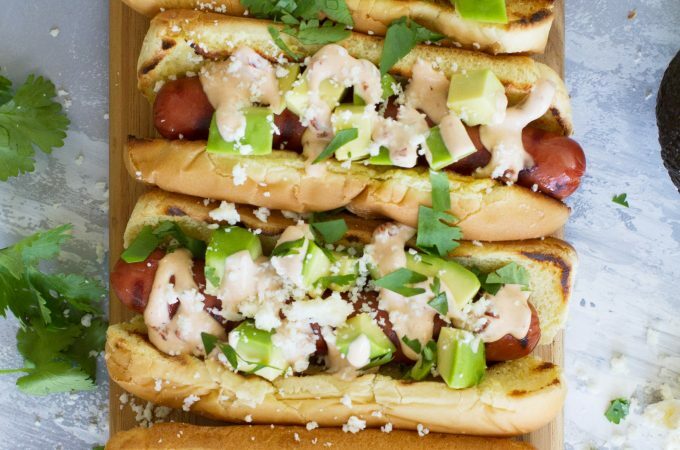 But – onto the food! 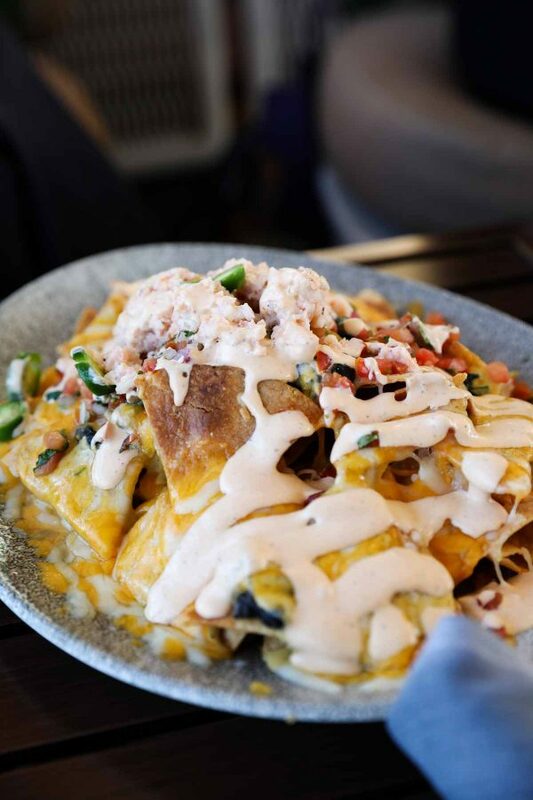 These are the famous Lobster Nachos. They were good. But honestly, I like the Lobster Galley Chips at Harbour Galley (at Disneyland) ten times better. But these were pretty good. 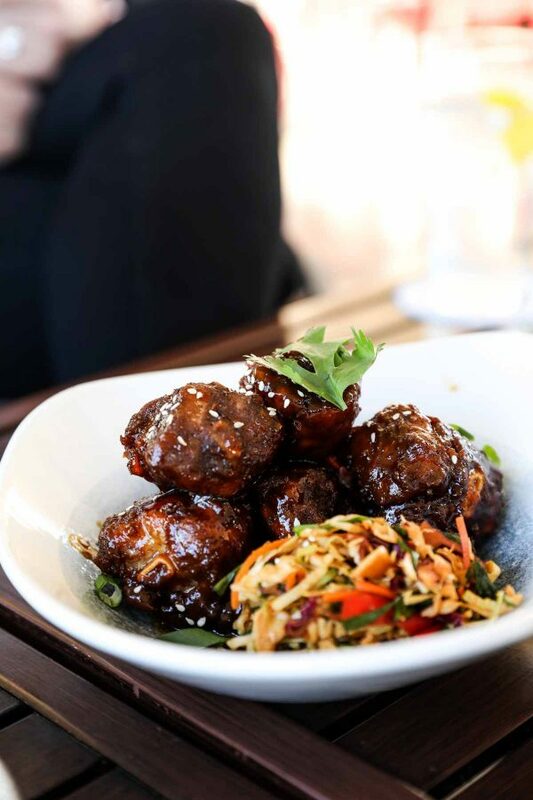 We also had the Crispy Piggy Wings. I didn’t hate these, but was a bit underwhelmed. But we all agreed that the slaw that was served with them was fabulous! 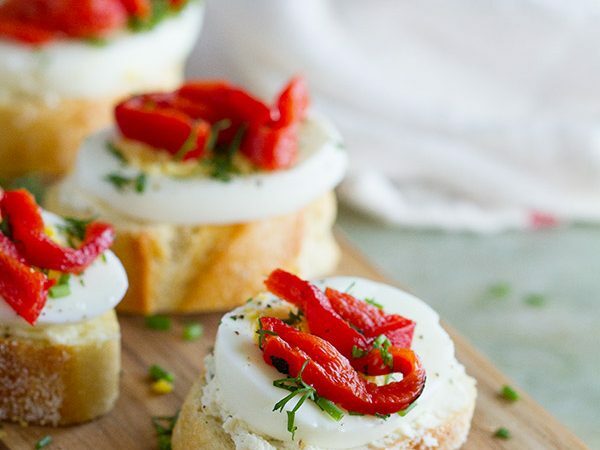 I don’t know if I would have ever chosen this Deviled Eggs and Toast, but it kept popping up on Instagram so we had to try it. Again, it was good, but not something I was going crazy over. Then we had to end the meal with the donuts with raspberry sauce and chocolate sauce. I am a self-admitted donut snob, and didn’t love these. They were fine, but not the best donuts I’ve ever had by any means. But they were fun! 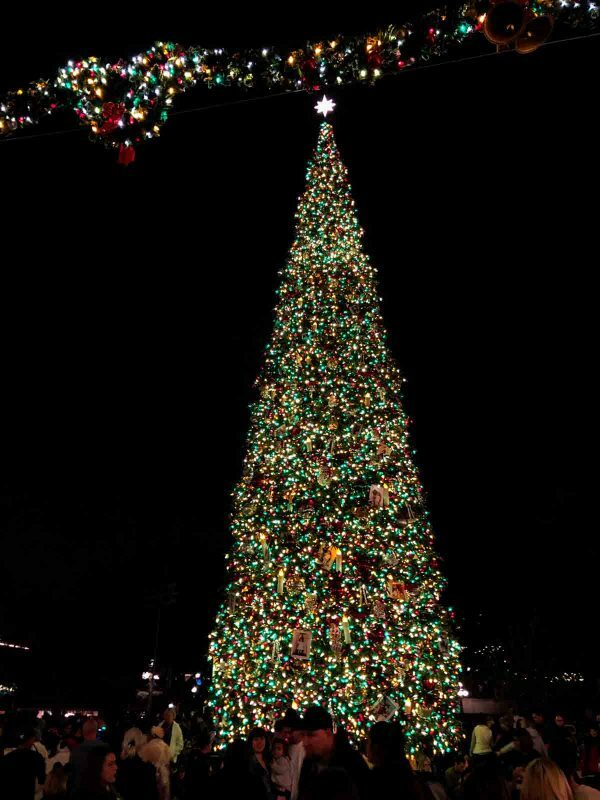 Last, but not least, was the Festival of Holidays. We all decided that we love, love, love all of the Disney festivals and the festival foods. And this one was so good! We made it through quite a few of the foods that were offered, but there was so much that we just didn’t have time (or room in our stomachs!) for. But this is definitely a festival I’d go back to next year! 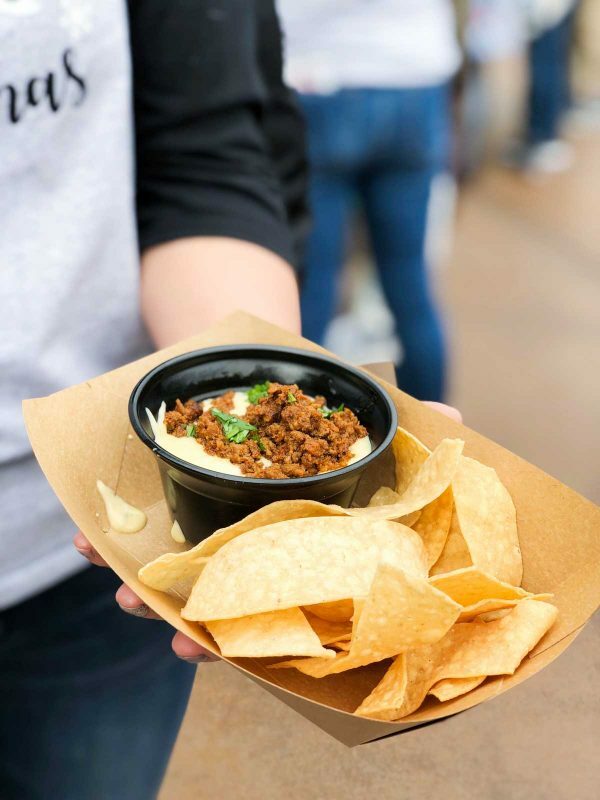 Chorizo Queso Fundido – this was a winner for all of us! 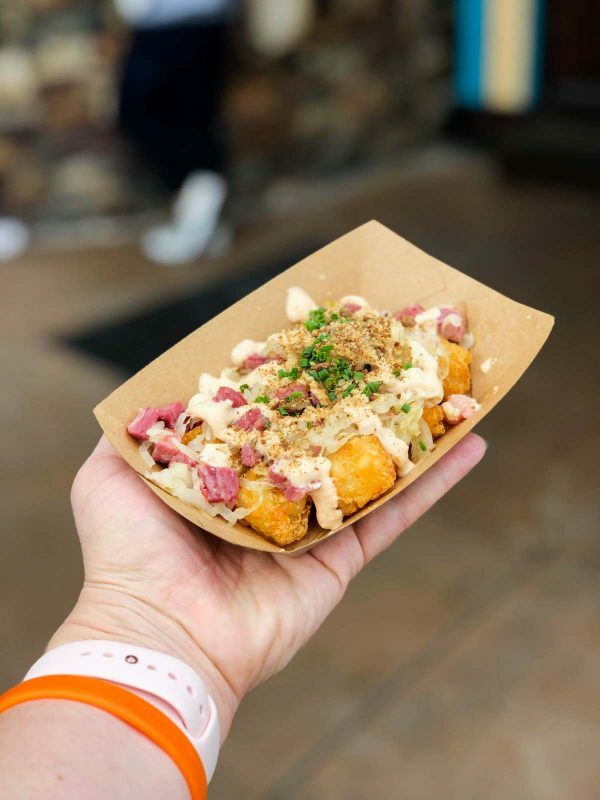 Reuben Potato Tots – The majority of us thought this was one of the favorites from the festival. 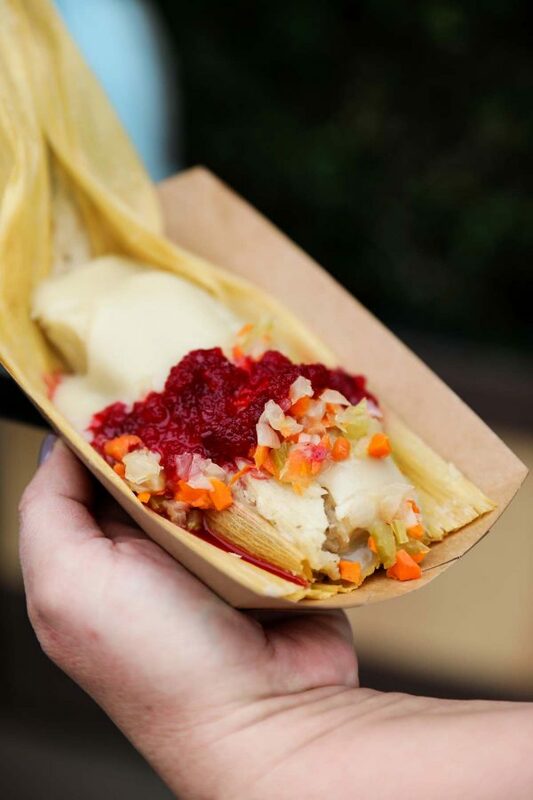 Turkey and Stuffing Tamale – I loved how inventive this one was! It really tasted like the holidays. 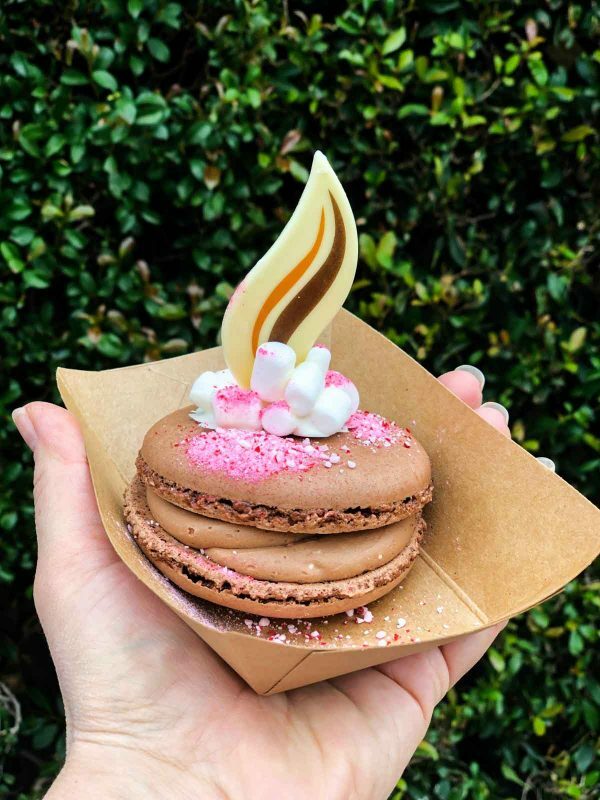 Hot Cocoa Marshmallow Macaron – If you asked my sisters what their favorite from the festival was, I’m pretty sure they would all say it was this macaron! Pozole Rojo Beef – This one was a little bit unforgettable, as well. Although I do remember the polenta and that it was good. 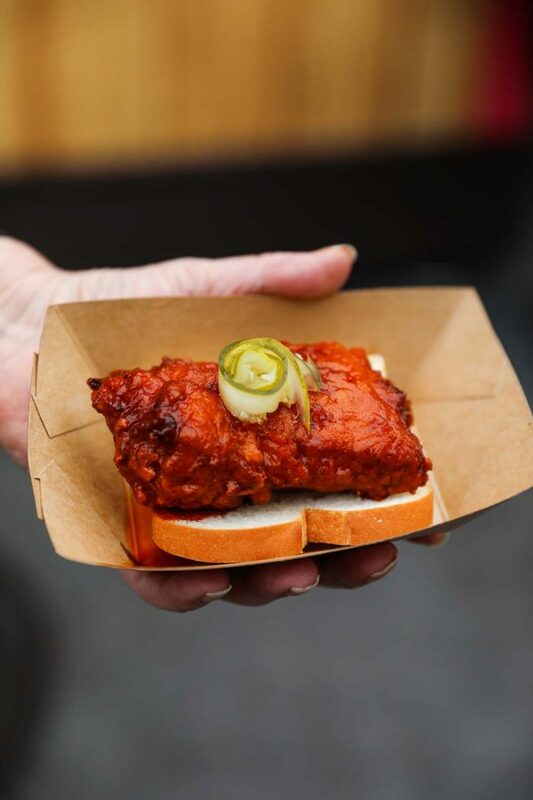 Nashville Hot Fried Turkey – I think this one was pretty good, but a little difficult to eat. Especially when you are sharing and you don’t have a table. But maybe it wouldn’t be so bad if you weren’t trying to cut it into 5 pieces. And that’s it! Another successful Disney trip down. 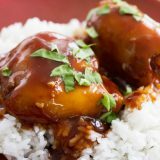 Make sure you check back for part 2 where I make something that is inspired by one of these dishes that we had on our trip to Disneyland! And if you have any Disney favorites, leave them in the comments below!